There’s nothing special about chlorella and sun sensitivity; it’s the chlorophyll in the chlorella. Chlorophyll heightens sun sensitivity in some people. If you have no problem eating high chlorophyll vegetables--such as spinach, kale, chard, collards, broccoli, grapes, celery--then it is unlikely chlorella will present a problem. I had a similar question to Jess earlier. Does this work to remove calcium? Calcium is technically a heavy metal. "Heavy metals" is an inexact term used to describe more than a dozen elements that are metals or metalloids (elements that have both metal and nonmetal characteristics) This includes Calcium, Copper, Lead, Arsenic, Cadmium, Chromium, Mercury, and Manganese. Because they cannot be degraded or destroyed, heavy metals are persistent in all parts of the environment. The cutoff point to be considered a heavy metal is a specific gravity of 5 gm per cubic centimeter. With that in mind, the specific gravity of both calcium is above 8 -- thus it is a heavy metal. Note: with a specific gravity of 2.55-2.80, aluminum is not a heavy metal -- but is treated as such in terms of toxicity and will also be pulled from the body by a good chelating agent. That said, an oral chelating formula can be highly effective at removing small amounts of heavy metals which have great toxicity at very low levels – mercury, arsenic, nickel, cadmium, etc. It will not remove a significant enough amount of metals that have a substantial presence in the body, such as calcium or iron, to be even the slightest bit noticeable. Also, the important thing with calcium is not so much the amount you consume or chelate, but how your body regulates where it redistributes the vast amount that is already present in your calcium bank—your bones—and for that, body pH is a primary consideration. I have successfully used many of the formulas developed and sold through Baseline Nutritionals, and greatly appreciate the expert and unparalleled advice that Jon Barron provides on this website. I have a general question about the risk of all heavy metal detox formulas for people who have been diagnosed with leaky gut. At a recent seminar I attended for Hashimoto's Thyroiditis, the presenter strongly discouraged the use of all such heavy metal detoxes because of the risk of re-absorption of the loosened metals back into the systems of people with leaky gut, and the resultant dangerous movement of those loosened metals into the brain, thus causing permanent damage. I am interested in hearing Jon's take on this position. Thank-you. Remember, Jon’s heavy metal detox formula is made with cilantro, chlorella, and fulvic acid. Were you instructed not to eat any of those? That would be unusual considering that chlorella and fulvic acid are recommended treatments for Candida. They also bind with heavy metals so that they can’t return to the brain from where the cilantro released them (cilantro crosses the blood/brain barrier. And keep in mind, there’s nothing to stop you from doing a program to bring Candida levels down before doing the heavy metal detox. In any case, if you start the heavy metal detox, you might want to start slowly with one dropper a day and then build up gradually over a couple of weeks to full dosage. If you have any problems, you can always back things down to a level that was previously comfortable and hold at that level. With the heavy metal detox, it’s not how much you take at one time—but how much you take over time. I am trying to detox from an Injection of botulinium toxin. Will choorella and cilantro work for me.. Unlikely. They are heavy metal chelators. When formulating Metal Magic were clinical studies done on the following heavy metals: Cesium, Palladium and Platinum? I am elevated in each of the metals in addition to Lead and Mercury. 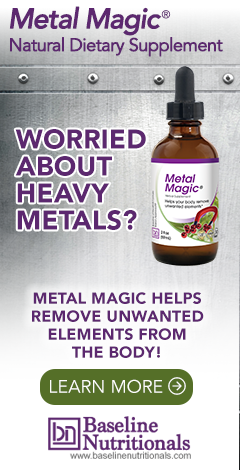 Do heavy metals work synergistically in the body? No, those metals were not specifically tested. As to a possible negative synergistic effect from multiple heavy metals, Jon explained one such example when he wrote about how fluoride makes aluminum more bio-available and better able to cross the blood brain barrier. If a person is now taking meds for hypertension .. and he decides to use protolytic enzymes, would its use remove some of the effects of the medication within the arterial wallls ? If so, how would you minimise any adverse results ? Proteolytic enzymes are unlikely to change the efficacy of any hypertension medications, be they diuretics, calcium channel blockers, or beta blockers. However, using proteolytic enzymes might require a change in the amount of medication you need. In any case, you will want to consult with your physician before using any supplements. If you follow the proper order in detoxing, then you are not releasing toxins into the bloodstream, with the exception of heavy metal detoxing. If you start with colon detoxing, it is doing most of its work in the colon, not the bloodstream. It prepares the body for easy elimination of toxins released in the rest of the detoxes. The kidney flush doesn’t actually release toxins. It helps flush out and repair the kidneys. The sludge that is flushed out never enters the bloodstream. It is dumped into the ureters, then the bladder, and then into the toilet. It also helps soften stones in preparation for the liver cleanse. The liver cleanse purges waste from the liver into the gallbladder and then out through the colon. The toxins only enter the bloodstream if the elimination channels are plugged and there is nowhere for the toxins to go. But if you do things in the proper order, that’s not an issue. In any case, there is no harm in doing things slowly to build up your comfort level. And, as always, if you are under a doctor’s care for your liver and kidneys, then you will need to work with them in regard to doing any detoxes. Hi, has Cilantro essential oil the same effect? It is stronger or it has lost its detox properties. In others sites, (sellers mostly) say it does but there is not any scientific bibliography. Could you tell me something about? I have Cilantro essential Oil but I have never use it to ingest or to massage. Thank you. We would question whether a cilantro essential oil is concentrated enough in the bioactives that actually break the bonds heavy metals have with human tissue to be effective as a detox agent. A quality tincture, on the other hand, contains all bioactives in a concentrated form and has proven to be effective. I mistakenly took 5000 Vit B 12, as part of improving over all health after Chemo and Radiation. Unbeknown to me there was high levels of Nickel in this product, and am so allergic to Nickel, if something just sits on my skin for five minutes with Nickel I will have an immediate reaction. Do you recommend your product for detoxing…. I wonder if you took cyanocobalamin or methylcobalamin. Avoic the cyano form. Cyano is cyanide-based. A different brand might not have the Nickel in it. Hi, I need to know if this would work on children ages 6 to 13 years? Since I've known they absorb heavy metals in a greater way that us adults. Yes, it would probably work with children the same as with adults as the mechanisms of action would remain unchanged. That said, we recommend that you consult with your pediatrician before using any herbal formulas with children. This advice would hold true for any natural formula that actually works VS a placebo. Will this help remove all Platinum group metals from the body? The formula has never been specifically tested for platinum, but the combination of cilantro and chlorella should work for all heavy metals. Should Metal Magic be taken away from mealtimes? I've been using chlorella and modified citrus pectin for lead chelation until now, and that's taken half an hour before a meal. That's so the pectin, and maybe the chlorella, can act as a bile-toxin binder. Does Metal Magic have a similar relationship with the release of bile? Thanks for answering questions! I have ALS . I was tested for metals after a chelating process of EDTA 1500 mg thru IV over a 3 hour period. then they tested my urine specimens over the next 6 hours. The test came back and my cadmium was 5.8 and lead was 17. They were in danger zone. Also had nickel thorium and tungsten, but these were high but not in danger zone. My question is how much of s your product would I need to be equivalent to 1500 mg of EDTA. The IV is expensive and I'm trying to find another option to remove toxins in my body. EDTA IV chelation certainly is the strongest form of heavy metal detoxing, but is indeed expensive and takes a number of repeat, time-consuming visits. With the oral formula that Jon created, the initial detox recommended is six bottles, which when used at the recommended rate of four droppers, three times a day, takes about 30 days—give or take. After that, Jon recommends a maintenance program of 2 bottles every six months. That said, the Baseline of Health Foundation does not actually have or sell any products—even Jon Barron’s formulas. We are purely an online information resource. All of Jon’s formulas, however, are available from Baseline Nutritionals. Hi, can you please tell me if the 'Metal Magic' would help a child of 7 with Autism, or what would you recommend should be undertaken. Currently a MMS formula by Jim Humble is being administered with positive but slow results, but tastes so vile for the child. I'm hoping to find something else more palatable and possibly even better/quicker acting. Thank you. For obvious legal reasons, we cannot diagnose or prescribe for specific medical conditions—merely provide information. That said, in answer to your question… If heavy metal toxicity were actively contributing to the child’s symptoms, then yes, using a heavy metal chelation formula to reduce the levels of those metals might help ameliorate some of the symptoms. If not, then probably not. Hi, is this suitable for children? and what will be the dosage? Instead of doing the initial 6 bottle cleanse back to back, could I spread it out over 6 months by taking one bottle every month? Would it still have the same effect?